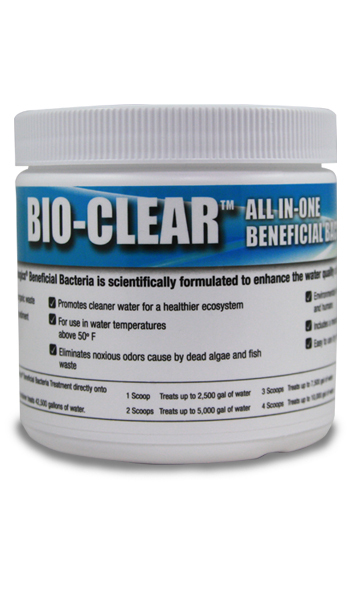 Pond Biologics® Bio-Clear™ All-in-one Beneficial Bacteria Pond Care contains a scientifically formulated beneficial bacteria blend for maintaining optimal water quality in water garden ponds. Fish waste, uneaten fish food, plant debris and other organic materials accumulate at the bottom of a pond creating sediment and unsightly murky conditions. As this organic waste decomposes, it releases nutrients that provide a food source for new algae growth. Pond Biologics® Bio-Clear™ All-in-one contains high concentrations of powerful Beneficial Bacteria strains that complement each other providing an all-around treatment that breaks down sediment built-up, suspended organic waste, lowers ammonia, nitrate and phosphate levels creating a cleaner and healthier environment for fish and all species. Accelerates the breakdown of all organic waste preventing sludge build-up. Promotes cleaner water for a healthier ecosystem. Contains microbial strains that are naturally occurring and environmentally friendly. Safe for all fish, wildlife, plants, and humans. Includes a measuring scoop for easier application. Available in 1 and 2-pounds containers. Sprinkle Pond Biologics® All-in-one Beneficial Bacteria Treatment directly onto the surface of the water. Repeat treatment every two weeks.